If you dream to learn kitesurfing, this is definitely for you. 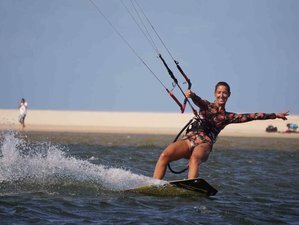 Join Bada Hostel in the kitesurfing paradise and learn this amazing sport. The wind conditions are perfect for the practice, besides the warm weather. No wetsuits needed. Meet people from all over the world and enjoy the good vibes. After your visit here, your life won't be the same. Join this unforgettable vacation, full of palm trees, coconuts, good food, nice people, and fun! The accommodation is at Bada Hostel, it is a beautiful and cozy place located few meters from the beach and the town (restaurants and bars)/ You can do everything by walking, no car is needed. The guests are mainly kitesurfers who come for learning the sport or improving new tricks. The hostel has a beautiful garden with pool, bar, barbecue, and a good Wi-Fi. They provide shared rooms or private rooms. Small parties at Bada Bar are usual. The atmosphere is amazing and perfect for solo travelers or friends. You will get 10 hours of kitesurfing lessons from International Kiteboarding Organization-certified instructors. The lessons are in the flat water at Lagoa do Cauipe or at the beach with no waves. The transfer to the lagoons is included in the price. If you want to kite in the sea, the hostel is located only one block from the beach. The meeting point for the kite camp is at the hostel. This kitesurf camp will be in Cumbuco, Ceará, Brazil. Cumbuco is a small beach village, that is famous for the perfect wind who kitesurfers from all over the world come to joy. The village offers many good restaurants, grocery stores, bars, and kitesurf lounges in front of the beach, with all amenities and security. Daily breakfast will be provided. The meal consists of fresh fruits, juice, eggs, sandwiches, and delicious cakes. Apart from having your driving adventure through the white dunes and lakes, you can go dune sledding, ride a cable down a dune, go horse riding or make a Jangada boat trip, all while enjoying beautiful views. Don't forget to see the sunset, be it from the beach or the top of a sand dune, for it is a spectacle! Complete your adventure by hiring a car or buggy to travel to the lakes or wherever you want to go. Here at Bada, the staff can arrange a rental car, four-by-four vehicle, or buggy for you. Please book your flight to arrive in Fortaleza (Ceará). The airport is Pinto Martins International Airport (FOR). Bada Hostel offers enjoyable holidays and exciting adventures.